Saving Tir na nOg by Kimberly S. Ruff is the first book in The Chosen Ones series. Madison's family sticks together no matter what. When her dad goes missing on a trip to Ireland, her family packs their bags to set out in search. Matters take a turn when her mom and sister Lexie disappear soon after they arrive in Ireland. Her godmother reveals her shocking origins of being a Sidhe and her role as a guardian to Madison since her birth. Madison is one of three Chosen Ones whose destiny is to fulfill a prophecy and save the other world of Tir na nOg. First, she and the other Chosen Ones must travel to Ogham where they must find their birth tree and eat berries so to awaken powers they'll need to stop the forces of evil and save her family. Magic, strength, and family are woven into an adventure in another world as three girls discover their calling as the Chosen Ones who are destined to save a magical world. Madison's life is full of love as she's surrounded by this warm family consisting of her parents, sister, and godmother. The biggest challenge in her life is her sister's health. Her sister had a kidney transplant as an infant so she's been on medicine ever since and has constant hospital visits - a worry for her family. Then everything changes when Madison's father disappears and a mystery is set up for her to solve. Her mom and sister's disappearance takes Madison's journey into a magical adventure beginning with her godmother Cha Cha's reveal about her magical lineage. This sparks Madison's journey to get her powers and fulfill a hero's destiny. Though she's on her way to being a hero, she's still young and has this sweet youthful innocence about her that adds to her genuine goodness. Her journey takes her from being a normal girl and changes her into this magical hero where she takes her birth name of Grania. The fairy creatures, such as the Kelpie, are seen in myth as the more dangerous sorts, but Kimberly S. Ruff flips these ideas and creates another image of them as loyal and helpful. Elgin is a Kelpie - which is known for drowning people - but Madison bonds with him and, for her, he's an ally and a loyal protector. Their destiny is to bring good back into the world and overcome evil with love, faith, and hope, which Ruff conveys through the Chosen Ones, who bring sparks of light and warmth to the world. 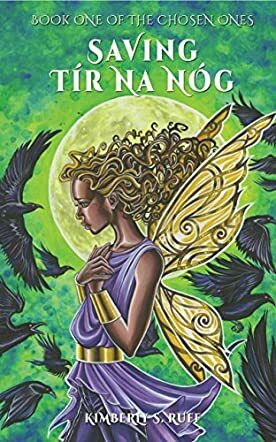 A dazzling read for all ages with family, friendship, destiny, and bravery, Saving Tir na nOg uses themes of faith, love, and hope through three Chosen Ones who are the literal embodiment of these ideals and who embark on an adventure to learn how to control their new powers to use goodness to fight against darkness.